When you have determined the specifications of each element, you then should think about the journey casino goers take on your website. What are they looking for? Should you put promotions on the home page? How many photos do they want to see? Ask yourself these questions and develop a web design plan for your gaming establishment. …and many more. If you are dissatisfied with your current platform, our programmers have also migrated hundreds of websites with little to no errors. A successful online casino site has to focus on the winning experience all your patrons want. Determine the type of atmosphere your casino creates and mirror that on your website. When it comes to web design you want to think about the journey web users are taking to get to your casino site and where they go from there. Do you want to tell them immediately about your new promotion or should be its separate page? Your website will be judged according to the content and the structure of the elements. If your pages, blogs, or articles, and missing the proper H1, H2, H2, etc. then online users will have a hard time reading and navigating through the site. When you design with SEO in mind, you are enhancing your customers experience on your site by letting them know exactly what to expect from reading a paragraph or where to find information. Going in blind to discuss web designs with your team of developers is a surefire way to have a casino site that is too flashy and not optimized for better user experience. Take a piece of paper or anything you are comfortable sketching on and start developing a map for your online casino website. 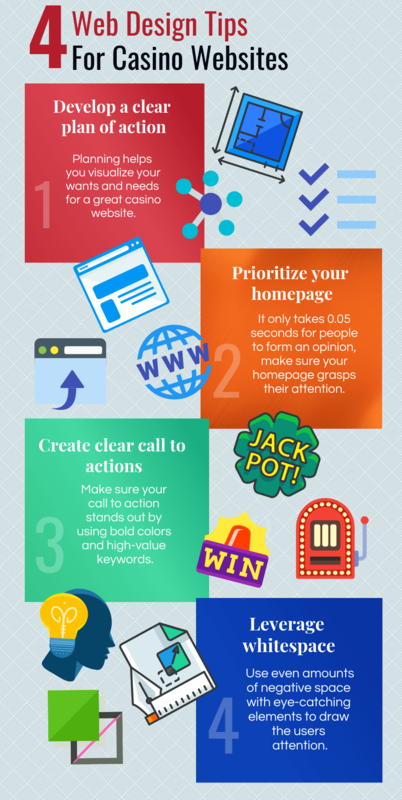 This will help you and the digital marketing developers visualize your wants and needs for a great website. The reality of web design is if you succeed on the homepage you are on the path of exponential growth, it takes web users about 50 milliseconds to form an opinion about your website. Chances are there are thousands of results for the searching “best casino” so, if your website is not attractive to the user they will simply go back to the google results page and click on the next option. You want your casino to be the one gaming hub they click on and stay on. What is your value proposition? As mentioned before, you have limited time to lure potential casino goers in. Make sure to have your value proposition is above the fold and lets users know how they will receive a valuable experience from going to your casino. Call to actions or CTAs play a vital role in getting a user to the final conversion step. With clear call to actions that drive your value proposition home, you can see increases in traffic at your casino and revenue. Make sure your call to action stands out by using bold colors and leveraging negative space to set it apart from the rest of the elements on your website. Include a click-friendly button on CTAs that appeal to your users and makes them want to get their game on with you. … and the list can go on. Your goal is to provide a casino website for your customers that is uncluttered and provides clear information on the gambling experience they are in for. A professionally done casino website will have even amounts of negative space with eye-catching elements to complement those areas. Remember, not every single part of a website is potential retail room. Allow customers to navigate through your website without feeling cluttered and bombarded with copy. It may be time for a complete re-design of your casino’s website, the developers at Optimum7 have years of experience designing websites for all industries.